Should the PM always be a member of Lok Sabha? PRITAM SENGUPTA writes from New Delhi: Plenty of reasons—good, bad, ugly, silly—have been dredged up by those supporting and opposing the Indo-US nuclear deal. But of the all points raised by those who would not like India to sign the dotted line and toe the American line, none is curiouser than the sudden doubts that have arisen in their minds on the legitimacy of the office of the prime minister. Yes, Prime Minister Manmohan Singh. 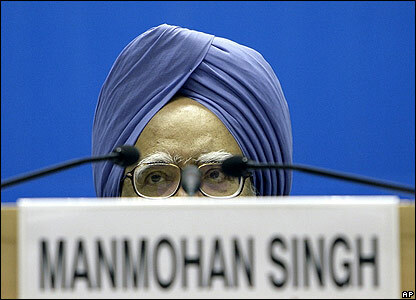 For four years and more, there has been no confusion about prime minister Manmohan Singh’s status. There were no doubts when Prime Minister Manmohan Singh was unveiling the National Rural Employment Guarantee Scheme. There were no doubts when Prime Minister Manmohan Singh was announcing farm packages and farm loan waivers. There were no doubts when Prime Minister Manmohan Singh was implementing the pay panel commission’s recommendations. Etcetera. But the sight of the same Prime Minister Manmohan Singh pushing the nuclear deal has them all shuffling around nervously: Can a prime minister, they ask, who is only a Rajya Sabha member, and not an elected member of the Lok Sabha, really override the opposition of the people to the deal? The underlying assumption here is that with the majority of members in the Lok Sabha—the house of the people—are against the nuclear deal. So, can a man who is only a representative of the States, the Rajya Sabha, ride roughshod over the voice of the people? Even if the ruling alliance somehow cobbles up a majority in the house of the people? In an July 1 editorial titled “Short-sighted adventurism“, The Hindu editorialised a point made by its editor N. Ram, a former collegemate of CPI(M) general secretary Prakash Karat, on a CNN-IBN show a few days earlier. The Times of India‘s editorial advisor Gautam Adhikari provided what seemed like a fine rebuttal on the same show, hosted by Sagarika Ghose, one which Ram ducked with a smile. In other words, is sauce for the Oxbridge goose not sauce for the Madras Christian College gander? So, does the PM have the right to go ahead with the n-deal despite only being a Rajya Sabha member? Is prime minister Manmohan Singh any less of a prime minister because he represents the States, not the people? Is this episode a cautionary lesson: should it made mandatory for the prime minister to be an elected representative of the people? More importantly, would the communists have been asking this question, if the n-deal was being signed with Russia or China in similar circumstances? This entry was posted in Issues and Ideas and tagged Churumuri, CNN-IBN, Gautam Adhikari, Indo-US N-Deal, Indo-US Nuclear Deal, Lok Sabha, Manmohan Singh, N.Ram, Prakash Karat, Rajya Sabha, Sagarika Ghose, The Hindu, The Times of India. Bookmark the permalink. Whatever it be… and whomever we are signing the deal with…. japan took bloody 7 years in ratifying a nuclear deal with US, why are we in such a hurry? H1b visas? trade with a sinking dollar? Middle class appeasement? (their amibition to migrate, wash their toilets and join the American Dream will have an adverse effect coz of this) eager to join the war against the “axis of evil” (1 member N.korea has already been pruned from it) or Is Manmohan recieveing some tips, like those 10,20rs. we keep in restaurants? Is the Prime Minister any less Prime Minister just because he is from Rajya Sabha? The constitution DOES NOT say that Prime Ministers elected through Lokh Sabha are 100% PMs and those who enter through Rajya Sabha are a few percentage points lesser!!!!!!!!!!!!! For goodness sake, Manmohan Singh is the Prime Minister of India and has every right to go ahead with any deal that he think is in the interest of the country…and he has been taking decisions for the past 4 years. Why discuss the obvious?? And pray, why discuss N. Ram and “The Chindu” so much, a newspaper that is read only in Chennai… and there too the readership is falling. oh… yeah! Lets all rally for the “Slimes of India”!! Left and Left-wingers should not be taken seriously. Simply ignore them. That is how to deal with them. Their value and credibility in India is exactly the same that of Vatal Nagaraj in Karnataka. The Left parties and their media minders have been obliquely questioning the authority of the Prime Minister only now, when the US has come into the picture and when there are legitimate questions to be raised about the secrecy and urgency behind the deal. But the BJP and their paid pipers in the media have been doing so for all these four years and more. The Left parties are raising a technical point when there is a large elephant in the room aka the N-deal. The Right on the other hand has been shamelessly slapping the most obnoxious labels on a gentleman-prime minister all through his term regardless of whether he deserves them or not. The prime minister in waiting has overlooked his own age, experience and maturity in calling the incumbent names. And his party has sought consistently to drive a wedge between the PM and the UPA chairman by pointing out his powerlessness. It has mocked the PM’s stature by calling him the “weakest” PM without a political base. Let us not pretend that this frontal personal attack is better than the legitimate points the Left has raised. If the PM’s case is so watertight, why doesn’t he reveal the contents of the draft agreement to the country? Or to Parliament? Why should the national security advisor extend the courtesy of an explanation to Amar Singh which he cannot afford the Left? Or the nation? If the PM was a member of the Lok Sabha and the same situation had ensued, would it have automatically made the deal right? No. By talking about The Hindu and N. Ram, we only personalise an issue which is much larger, and of deep import to this country’s future. That doesn’t mean the Left is right, but when the principal opposition party has stopped asking sane questions and only knows how to raise the emotive pitch (like today’s Bharat bandh) in a mature democracy somebody else has to step in. This question should have been asked 4 years back. The answer is a clear no, but it is preferable to be a Lok Sabha member. But more importantly, he/she has to a leader of a big party on his/her own right. We have seen what happens when the prime-minister is selected or nominated and not actually elected. Any issue that requires a decision gets postponed and an expert committee is setup to go over the issue. Mercifully Devegowda and Gujral could not stay on for long. For the first time we have a bureaucrat close to completing a full term. There is every possibility that history will see this term as another set of ‘lost’ years, for so much could have been done, but nothing happened. The Prime Minister Should not be a PUPPET. Rest all is o k.
Unfortunately the Current Prime Minister , President , Vice President Function as Puppets. Puppets being from Rajya Sabha or Lok Sabha ? How does it matter. Pl spare us these fairy tales about the spartan habits of the Commies. N.Ram retains a staff of 15 and a fleet of vans to ferry victuals for his 25 white pomeranians/spitzes who are housed in an air conditioned kennel. The leadership of the RSS and many in the BJP are single, and as a matter of principle will not use an air conditioner. Our 1st President Babu Rajendra Prasad took a tonga ‘home’ alighting from the train that returned him to Patna after he demitted office. He spent his last days in the Congress party offices in Patna, in a fanless room, on a charpoy, sharing a common bathroom. What non-sense. No body is arguing that Prakash Karat’s approval is needed. The question is whether a majority in Parliament supports the deal. Most of the people in this country including MPs had no role to play in the deal. Only bureaucrats have been involved. Manmohan Singh who is just a retired babu has given no political shape to this deal. Not surprisingly its the political issues that are controversial. Promising “never to conduct nuclear tests again” is not a decision that can be left to babus. Similarly dragging India into a strategic partnership with US with a potential to harm China and Iran militarily is not a decision to be made by babus either. Liked it…nothing more can be said about Hindu these days…as the letter itself points out! The same farm loan waiver and NREG are praised by N.Ram and Sainath! Leftists are opposing the deal just because the deal is with America. And this same reason makes leftists opinion a baseless. Rightists are stalling the deal just because they want to take credit of finalizing the deal in their power. These hypocrats doesn’t have national interest over their selfish agenda. There is no valid point raised yet, that the deal is not in national interest. I am not neither saying that the deal is absolutely perfect nor opposing the deal. If the deal is with national interest, then why toe the line of narrow thinking? He must change his name to Manamohansingh Gandhi or Manamohansingh Nehru. Clash says it all. I don’t care what mishapen political body Dr. Singh is a member of. Singh, Sonia, and the rest who seem to be in a hurry to make the country the 51st state of the U. S. should be retired. Sovereignty is a concept they do not understand. The go-between former president doesn’t seem to, either. Maybe sixty-one years of independence is enough for us. We should allow ourselves to be colonialialised again. If the PM should always be from the Lok Sabha, we might as well abolish the Rajya Sabha. It is already slightly more than a debating society these days. The reason being the PM should get elected by common men, and should not be selected by conmen, as it happens in Rajyasabha. Rajyasabha seats are under auction, many a times. Definately the deal went through and we will benefit from that. Raising the questions about whether a rajya sabha member PM should take desicion is raising question on the Indian Constitution. That is not right in itself and beyond that he is supported by majority in lok sabha. Is that not enough.